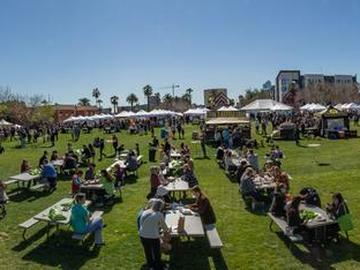 The 4th Annual PHX Vegan Food Festival returns to downtown Phoenix this February! Hosting over 100 of Arizona's top Vegan Restaurants, Food Trucks, Artisans and Vendors! Located in the heart of downtown Phoenix. Coming February 23 and 24, 2019! Event highlights include vegan food trucks & restaurants, food purveyors, an artisan market featuring vegan-friendly food and products, chef demo presentations, three stages of music and entertainment, community activities plus a kid's activity area. Kids 12 and under will recevie FREE ADMISSION but must be accompanied by an adult and must have their own ticket for entry. All patrons must have their own ticket for entry. No exceptions. Gates open at 10am for VIP ticket holders, 11am for GA ticket holders. Food is not included with the cost of the ticket. Held rain or shine. Last call for alcohol is thirty (30) minutes prior to closing. Re-entry allowed based on venue capacity. The festival is all ages. Kids under 12 are free. Child ticket holders will require an adult with them to enter the festival. Child ticket holders are not subject to a VIP swag bag. Child swag bags are available in the kids activity area. No animals allowed. In compliance with the law, certified ADA service animals are allowed. There are no ATM's inside the Festival grounds. Please bring cash, although some vendors do accept credit/debit cards. Festival grounds are wheelchair and ADA compliant. All ticket sales will require a current and up to date photo ID and will be checked upon admission inside Festival grounds. No outside food or beverage allowed inside the Festival grounds. No smoking allowed inside Festival grounds. No weapons will be permitted inside Festival grounds. We will have security and police presence. No drugs, outside alcohol or tobacco allowed inside Festival grounds. No coolers. No knives / weapons etc. No fireworks / explosives. No drones or aerial devices. No Instruments. No bota bags or growlers. No glassware. Yes blankets and lawn chairs. Yes small backpacks (or fanny packs if you prefer). Yes to plastic tupperware. Yes cameras, GoPros and cell phones. This ticket is a revocable license to attend the event listed on the front of the ticket and is subject to the full terms found at www.ticketmaster.com. Such license may be revoked without refund for noncompliance with terms. Unlawful sale or attempted sale prohibited. Tickets obtained from unauthorized sources may be invalid, lost, stolen, or counterfeit and if so are void. This ticket may not be resold for an amount in excess of the face value of the ticket without the written consent of issuer. Complimentary tickets not exchangeable or redeemable for any benefit offered to tickets with a dollar value. TIME & DATE SUBJECT TO CHANGE. This ticket may not be used for advertising, promotion or other trade purposes without the written consent of issuer. Applicable taxes are included. Holder assumes all risks occurring before, during or after event, including injury by any cause, and releases management, facility, participants, owners, vendors, artists, their representatives and personnel, Ticketleap, Davisson Entertainment, LLC, PHX Vegan Food Festival and their respective affiliates and representatives from any related claims.Take care of your ticket, as it can’t be replaced if lost, stolen or destroyed, and is valid only for event and seat printed on ticket. The barcode only allows one entry per scan. Unauthorized duplication or sale of this ticket may prevent your admittance to the event. By purchasing a ticket to entry into the event, the buyer understands that they may be included without knowledge or authorization on photography or videography recording means. The buyer acknowledges that this means their face or body may appear on a marketing or promotional photo or on a marketing or promotional video of any sort. The ticket buyer forgoes any right to ownership privelages or rights via any recorded photography or videography. BY ENTERING AND BY YOUR PRESENCE AT THE PHX VEGAN FOOD FESTIVAL, YOU CONSENT TO BE PHOTOGRAPHED, FILMED AND/OR OTHERWISE RECORDED. YOUR ENTRY CONSTITUTES YOU CONSENT TO SUCH PHOTOGRAPHY, FILMING AND/OR RECORDING AND TO ANY USE, IN ANY AND ALL MEDIA THROUGHOUT THE UNIVERSE IN PERPETUITY, OF YOUR APPEARANCE, VOICE, AND NAME FOR ANY PURPOSE WHATSOEVER IN CONNECTION WITH THE PHX VEGAN FOOD FESTIVAL. YOU UNDERSTAND THAT ALL PHOTOGRAPHY, FILMING AND/OR RECORDING WILL BE DONE IN RELIANCE ON THIS CONSENT GIVEN BY YOU BY ENTERING THE FESTIVAL GROUNDS. IF YOU DO NOT AGREE TO THE FOREGOING, PLEASE DO NOT ATTEND THE PHX VEGAN FOOD FESTIVAL.